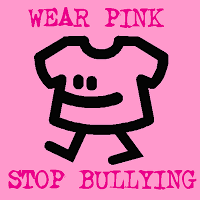 International STAND UP to Bullying Day is a special semi-annual event in which participants sign and wear a pink “pledge shirt” to take a visible, public stance against bullying. The event takes place in schools, workplaces, and organizations in 25 countries across the globe on the third Friday of November to coincide with Anti-bullying week, and then again on the last Friday of February. The mission of the International Bullying Prevention Association is to support and enhance quality research based bullying prevention principles and best practices in order to achieve a safe school climate, healthy work environment, good citizenship and civic responsibility. 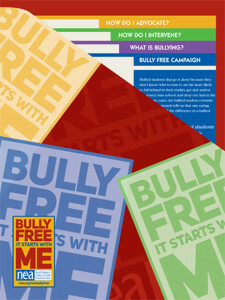 It has taken more than three decades of academic study of bullying behaviors, public revelations and attention to the true consequences for those who bully and those who are bullied and world-wide media coverage of incidents of unspeakable cruelty, suicide, and homicide, to bring educators, students, law enforcement, health care workers, and parents together in a global effort to do something about it. Bullying hurts and for those involved, the hurt can last a lifetime. As a world, we are learning that bullying behavior can be the root of serious violent situations in our schools. Many countries have adopted policies and procedures for Safe Schools. Project Anti-Bully is a non-profit 501(c)(3) run by students for students that raises awareness of the prevalence of bullying in schools globally through community-based research. Project Anti-Bully has headquarters in the United States of America and affiliates in Argentina, Australia, Austria, Canada, China, Colombia, El Salvador, England, Germany, Greece, Ireland, Italy, Malaysia, Mexico, New Zealand, Norway, Peru, Poland, Scotland, Sweden, Taiwan, The Philippines, and Uruguay. The aim of the ABC is to oppose the culture and practice of bullying within the CRC/Children’s Movement – and to lay the basis for a culture of tolerance and peace, and a commitment to using peaceful methods to resolve conflict. Rob Frenette, 20 and Katie Neu, 18 the Founders of BullyingCanada.ca, a Youth-Created Anti-Bullying Website are very pleased to announce the official launch of a national toll-free line for youth, parents, and the general public up to date information related to bullying. A program to reduce bullying within Chile’s schools has shown positive results since its introduction in 2005. The Paz Educa Program aims to produce and promote observation-based research in order to prevent school violence in Chile. 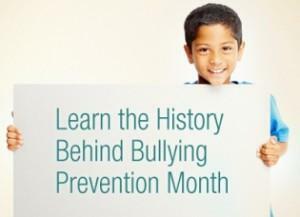 National Bullying Prevention Month was started in 2006 by the PACER’s National Bullying Prevention Center to raise awareness about this important issue and what people can do about it. Communities, schools and individuals are encouraged to participate in understanding this problem and getting involved in outreach efforts and educating people. Businesses and organizations like Facebook, Yahoo!Kids and CNN have gotten involved to get the word out. PACER was inspired to create the month as a way of showing people that bullying isn’t just a “rite of passage” for every kid, for some it can lead to terrible emotional, psychological and physical pain that no one should endure. “Make it Orange and Make it End,” is the Unity Day slogan. This year Unity Day is on October 10th, people are encouraged to wear the color orange on this day to show their solidarity with the bullying prevention cause, even Ellen DeGeneres got involved last year by wearing an orange anti-bullying shirt on her show! You can also hand out “unity” ribbons and buttons at your school or write “unity” on your binders to create awareness. Read more: Bullying Prevention Awareness Month https://www.kidzworld.com/article/27443-bullying-prevention-awareness-month#ixzz2cdlhVjXu National Child Traumatic Stress Network In support of Bullying Prevention Awareness Month, the National Child Traumatic Stress Network (NCTSN) is providing resources for families, teens, educators, clinicians, mental health professionals, and law enforcement personnel on how to recognize, deal with, and prevent bullying. Read more. Teaching Tolerance When nearly one in five students is bullied each year, it’s no wonder the topic is on educators’ minds. 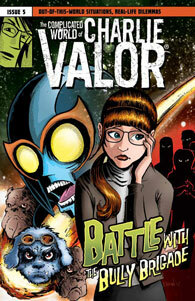 Teachers want to make their classrooms safe, supportive learning environments. Administrators want positive school climates. Both are looking for tools to reach these goals. To meet their needs, Teaching Tolerance offers an abundance of professional development tools, classroom activities, magazine articles and blogs dedicated to the topic. When you have an immediate question, though, finding what you’re looking for among such extensive resources can be daunting. October is National Bullying Prevention Month in the US, the NYTimes has updated their full list of resources on bullying and cyberbullying for the occasion.